Roll away with this sporty black/grey duffel. The side handles and removable/adjustable shoulder strap makes it easy to carry or pull it along on 2 wheels, with a sturdy reinforced base. With an extra large main and bottom compartment, and outer mesh bottle pocket there?s room for it all. Fold/zip it down to a fitting 12"x13"x5" size! Finish/Material: 600D Poly Dimensions: 20 1/2" W x 12 1/2" H x 12" D Imprint Area: 5" W x 5" H Print orders with more than three colors require a full color transfer and seven working days from art approval. Shipping Information: Carton Size: Box Length: 20.00 Box Width: 16.00 Box Height: 14.00 Standard Packaging: Bulk Packaging Carton Weight: 40lbs / 20pcs. Made Of 420D Polyester. Large Insulated Cooler. Holds Up To 50 Cans. Front Zippered Pockets. 2 Mesh Side Pockets. Top Insulated Compartment. Web Handles With Sturdy Grip. 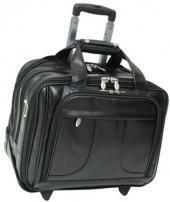 Retractable Auto Lock Handle, Rolling Cooler With Nylon Wheels. Note: Other decorating methods available, please call. Approximate Bag Size: 12" W x 18" H x 9" D Imprint Area: 4" W x 4" H. Packaging: 4 per carton @ 24 lbs. Made Of 70D Cross-Weave Nylon. Sport Zipper Pulls. 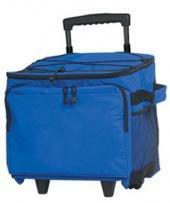 Retractable Auto Lock Handle Rolling Cooler With Nylon Wheels. Watertight Cooler Section With Dual Zippers. Front Storage Pocket And Bungee Cords On Top. Folds For Easy Storage. Holds Up To 48 Cans. Approximate Bag Size: 11 1/2" W x 13" H x 14" D Imprint Area: 8" W x 5" H. Packaging: 4 per carton @ 23 lbs. Straps and wheels! A backpack that converts to rolling bag at the drop of a hat. Padded laptop pouch inside main compartment. Front zip pocket. Detachable shoulder straps. Montana Collection also available in a backpack, duffel and laptop bag option. Materials: 600D (Denier) Polyester with PVC (Polyvinyl chloride) backing and 600D (Denier) Polyester ripstop. Size: 12-1/4"w x 17"h x 6"d Imprint Area: Upper Left (Standard): 3"w x 3"h, 2 color(s) max. Packaging: Bulk Pack Of: 2 Weight: 13 lbs. This carry-on sized wheeled briefcase keeps everything you need for appointments, business and overnight trips together. Wheeled for convenience with collapsible handle. Padded interior sleeve fits up to 17" laptop. Large zip compartment for clothing or other business accessories. 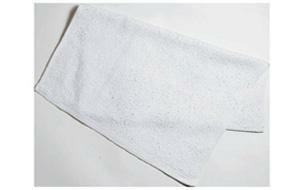 Materials: Microfiber with sponge PVC (Polyvinyl Chloride) backing. Size: 17-3/8"w x 14"h x 6"d Imprint Area: Front Pocket (Standard): 6"w x 6"h, 4 color(s) max. Packaging: Bulk Pack Of: 4 Weight: 16 lbs. Large main compartment has a D-shaped zippered opening, outside pocket. Constructed of 600D Polyester/Dobby with piping accents, this duffel has a heavy-duty running board on base for protection. Features inline skate wheels, external molded protective feet, telescopic handle and adjustable/ removable shoulder strap with rubber comfort guard make for easy transport. Product Size (H x W x D): 12.00 x 20.00 x 10.00 Imprint Area: Front Pocket 3"h x 7"w Packaging: Polybag Pieces Per Box: 4 Weight Per Piece: 1.80 lbs. Weight Per Box: 7.20 lbs. Case Dimensions (L x W x H): 26 x 26 x 25. Versatile urban backpack featuring Logomagic decoration can be wheeled or carrie. Main compartment features padded, removable computer sleeve (sleeve size: 11W 15H 2.5D). Front zippered pocket with multi-function organizer. Padded back panel conceals telescoping handle and inline skate wheels when not in use. Hidden, padded backpack straps and grip handle. Sides feature reinforced straps for support. Large, expandable side pockets. Patent pending. Fabric/Material: 420d polyester Size : 14"L x 20.5"H x 8"W. Imprint Area: Top panel 2.25"W x3 75"H Shipping Information: Carton Size: 24"L x 17"H x 16"W Quantity: 4 Weight: 22 lbs. Other decoration methods are available for this item, please call. The Frequent Flyer is sturdy and roomy, ensuring convenient traveling every time. A front accessory pocket provides easy access to passports, I.D.s, books, snacks and more. Made of 1680D polyester with 210D nylon lining Retractable, 2-level pulling handle Inline skate wheels Reinforced frame I.D. sleeve Zippered front accessory pocket Front stabilizer Expandable up to 3". Size: 14-1/2W x 22"H x 8"D (expands to 11"D) 45-1/2 Linear Inches. Standard Print Area: Lower pocket, 7-1/2W x 7H Optional Embroidery Area: Lower pocket, 5-1/2 Diam. Please call for additional charges for this option. Packaging: Bulk Package Quantity: 2 Package Weight: 18 lbs. Ergonomic light weight telescopic pull bar. Rubber molded comfort handle. Inline skate wheels with protective cover for backpack mode. Outside straps for securing the bag. Mesh airflow cushioned back and straps. Expandable side zippered utility pockets. MP3 pocket with earphone outlet. 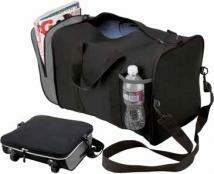 Large capacity main compartment with deluxe accessory organizer. Unique hide-away strap compartment. Large computer compartment with padded pouch. Front zippered storage pocket with integrated pen loops. 1680D Polyester. Sturdy bottom board with heavy duty protective feet. Product Size (H x W x D): 20.00 x 15.50 x 8.50 Imprint Area: Top Pocket Packaging: Polybag Pieces Per Box: 4 Weight Per Piece: 5.25 lbs. Weight Per Box: 21 lbs. Case Dimensions (L x W x H): 26 x 15 x 17. Made of 600D polyester in an exclusive camo print. 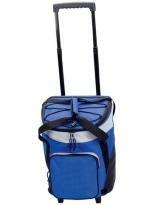 This extra large duffle has a built-in pull-up handle and recess wheels making it easy to roll. Spacious main compartment will accommodate all the loads you need for your traveling, camping, or hunting trip. A top pocket in front and side for accessories and incidentals. Dual handles and detachable shoulder strap. Size: 30" x 14" x 14" Imprint Area: On front pocket or top flap approx. 7 1/2" x 6" H.
With a rustic appeal, this rolling duffel is the perfect size for last minute business trips and extended getaways! Wheeled with a hideaway pullout handle for a smooth journey, large capacity compartments, signature lining, and long lasting black or brown Novohyde, luggage tag and wrapped handle. Finish/Material: Novohyde, Vinyl Dimensions: 14" W x 12" H x 24" D Imprint Area: 1 1/2" W x 7/8" H Shipping Information: Carton Size: Box Length: 26.00 Box Width: 13.00 Box Height: 19.00 Standard Packaging: Gift Bag Carton Weight: 42lbs / 6pcs. This mesmerizing mix of 1680d nylon and 600d polyester is up-dated and stylish, Wide -open at the top, this rolling case allows effortless organization of your workload, Its computer compartment, with adjustable divider, can accommodate up to a 17" laptop, A fold able, triple- accordion file is set in place, A zip compartment in front with pockets for a calculator, phone, cards, pens, stick memory, keys and notes, in addition to dual side zip pockets for accessories. Imprint: On the vinyl patch approx. 2" x 1 1/4"(H). 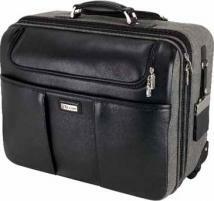 Size : 17" x 13 1/4" x 8 3/4"
Constructed with durable 1680D Polyester, this product will organize all your business needs. Includes a removable padded laptop pouch, accordion file divider for documents, deluxe front organizer, side zippered mesh beverage pocket, rear hide-away zippered pocket for pull bar and built-in id. Holds a standard 17? laptop. The pilot case shape opening provides convenient access to the internal compartment. Travel-friendly features include a chrome finish telescopic pull bar, detachable/adjustable padded shoulder strap and premium inline skate wheels with sturdy base and stand. Product Size (H x W x D): 17.00 x 17.50 x 10.00 Imprint Area: Front 3/4"h x 1 3/8"w Packaging: Polybag Pieces Per Box: 2 Weight Per Piece: 7.90 lbs. Weight Per Box: 15.8 lbs. Case Dimensions (L x W x H): 17.7 x 18.2 x 15. A great addition to the Life in Motion collection, this mobile office gets you through the airport quickly and efficiently. Padded back computer sleeve with Viewpoint System molded tray allows for easy scanning and maximum protection of your laptop (up to 15.4"). Tray features attachment straps and top grab handle to allow for easy removal. Telescoping handle and inline wheels for smooth rolling. Main compartment to help you organize your documents and technology. Front zippered pocket features multi-function organizer. Padded grab handles. Side features mesh water bottle pocket (water bottle not included.) Patent pending. Fabric/Material: 1680d ballistic Size: 16"L x 13.5"H x 9"W Imprint Area: Front pocket center 7"W x 3"H Shipping Information: Carton Size: 22"L x 11"H x 18"W Quantity: 1 Weight: 9 lbs. Other decoration methods are available for this item, please call. Holds a standard 17? laptop. 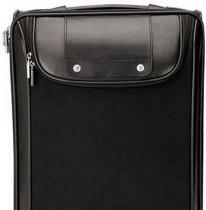 Features a back telescopic handle strap, rear hide-away zippered pocket for pull bar and built-in id. Includes a front compartment with padded laptop pouch, 1 zippered pocket and 3 padded file dividers, a front pocket with accordion file divider for documents and a zippered deluxe front organizer. Travel-friendly features include an chrome finish telescopic pull bar, detachable/adjustable padded shoulder strap and premium inline skate wheels with sturdy base and stand. The back compartment is for clothes with tie-down strap and supportive side straps when open. 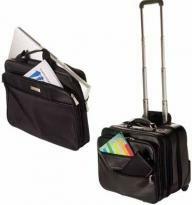 , Constructed with durable 1680D Polyester, this product will organize all your business travel needs. Product Size (H x W x D): 22.50 x 15.00 x 10.00 Imprint Area: Front 3/4"h x 1 3/8"w Packaging: Polybag Pieces Per Box: 2 Weight Per Piece: 7.20 lbs. Weight Per Box: 14.4 lbs. Case Dimensions (L x W x H): 20.1 x 17.3 x 18.2. Includes a compartment with padded laptop pouch, accordion file divider for documents and deluxe front organizer. Holds a standard 17? laptop. Second compartment for clothes, rear hide-away zippered pocket for pull bar and built-in id. Constructed with durable 1680D Polyester. Travel-friendly features include an chrome finish telescopic pull bar, detachable/adjustable padded shoulder strap and premium inline skate wheels with sturdy base and stand. Product Size (H x W x D): 21.00 x 15.00 x 10.00 Imprint Area: Front 3/4"h x 1 3/8"w Packaging: Polybag Pieces Per Box: 2 Weight Per Piece: 8.40 lbs. Weight Per Box: 16.80 lbs. Case Dimensions (L x W x H): 14.6 x 21.7 x 20.1. A briefcase, overnight and computer bag. 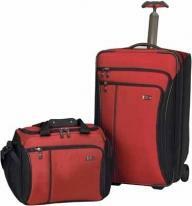 Features: multiple document compartments, overnight suitcase compartment, removeable padded computer case, durable wheels and retractable handle. Product Size: 16" x 9" x 14" Imprint Area: 8" x 2 1/4" Packaging: WT/PC: 21 lbs./2 units (master carton) Indiv.polybag: Individually Polybagged. Large main compartment has a U-Shaped zippered opening, two side pockets, and a drop-bottom zippered compartment for shoes and clothing. Constructed of 1680D Polyester with 1200D Polyester bottom shell. Concealed chrome finish telescopic handles and inline skate wheels and adjustable, removable shoulder strap with rubber comfort guard make for easy transport. Product Size (H x W x D): 28.00 x 16.50 x 15.00 Imprint Area: Front 3/4"h x 1 3/8"w Packaging: Polybag Pieces Per Box: 4 Weight Per Piece: 9.50 lbs. Weight Per Box: 38 lbs. Case Dimensions (L x W x H): 30 x 16.2 x 20.5. Stylish brown and black combination, roomy interior with double security straps and zip closure, accordian style document holders, two-way vertical and horizontal carry handles, 39" trolley handle, matching luggage tag included. Finish/Material: Leather, Twill Dimensions: 20" W x 14" H x 8 1/2" D Imprint Area: 2 3/4" W x 5/8" H Shipping Information: Carton Size: Box Length: 21.00 Box Width: 18.00 Box Height: 14.00 Standard Packaging: Gift Bag Carton Weight: 27lbs / 2pcs. Exterior back zip pocket with ID window, secure luggage straps, Signature Bettoni lining, top and bottom handles, front storage flap, front zippered compartment with 2 pockets, D-ring key holder, 38" extending trolley handle. Finish/Material: 1680D Nylon, Luccahyde Dimensions: 14" W x 20" H x 10 3/4" D Imprint Area: 2 1/2" W x 1 1/2" H Shipping Information: Carton Size: 15" W x 22" H x 23" L Standard Packaging: Gift Bag Carton Weight: 20lbs / 2pcs. Tallux Colection: One-touch, dual-trolley handle system. 80mm inline skate wheels provide a smooth, stable roll. Gusseted main compartment provides easy access to packing area; features two stash pockets for storing accessories and more. Front zippered pocket ideal for travel documents, keys and other small items. Dual haul handles. Size: 16"w x 13.5"h x 8.5"d.
CH-97 Collection: One-touch, dual-trolley aluminum handle system recesses into bag when not in use. Spacious main compartment expands 2" for additional packing capacity. Interior mesh compression straps feature a zippered pocket for additional organization. Large, interior door pocket features a zippered u-shaped opening and internal mesh zippered pocket. External strap system compresses around the bag to keep contents secure. Removable Attach-a-Bag strap secures an additional bag to the front of the upright for consolidated travel. Durable 1500D polyester combined with 600D VAC (Vinyl Acetate Co polymer) coated polyester for added strength. DISCONTINUED Size: 15"w x 20.5"h x 7.5"d Decoration Size: 2"w x 4"h. Opposite of Swiss Army Shield. Convenient dual compartment duffel holds everything you need for an extended stay. Large, u-shaped opening with lockable sliders provides access to main compartment and features interior compression straps to secure items. Rev 360 rotating handle system puts hand in a natural position, reducing wrist strain. 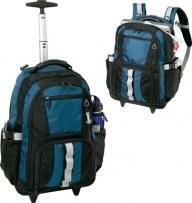 Lockable, zippered bottom compartment allows easy access to items. Zippered end pocket large enough to store shoes features easy-to-clean, antibacterial inner lining. Gusseted, zippered front pocket for additional storage. Custom inline skate wheels. Rear guard rails. Top haul handle, dual cargo handles and bottom grip slot. Size: 14"w x 24"h x 14"d. Decoration size: 5"w x 5"h centered on front pocket. Exterior back zip compartment with multiple document pockets, three interior zip pockets, adjustable security strap, padded carry handle, 39" trolley handle, matching luggage tag included. Finish/Material: Leather Dimensions: 14" W x 20" H x 11" D Imprint Area: 2 3/4" W x 5/8" H Shipping Information: Carton Size: Box Length: 8.00 Box Width: 7.00 Box Height: 6.00 Standard Packaging: Gift Bag Carton Weight: 27lbs / 2pcs. 25" Expandable Wheeled Upright. CH-97 Collection: One-touch, dual-trolley aluminum handle system recesses into bag when not in use. Spacious main compartment expands 2" for additional packing capacity. Interior mesh compression straps feature a zippered pocket for additional organization. Large, interior door pocket features a zippered u-shaped opening and internal mesh zippered pocket. External strap system compresses around the bag to keep contents secure. Removable Attach-a-Bag strap secures an additional bag to the front of the upright for consolidated travel. Durable 1500D polyester combined with 600D VAC (Vinyl Acetate Co polymer) coated polyester for added strength. Size: 18"w x 25.5"h x 8.25"d [expands to 10.25"d] Decoration Size: 3"w x 4"h Opposite of Swiss Army Shield. Padded canvas case, front and back zip pockets with accessory holder, multiple interior pockets, secure luggage strap, full size zip pocket, reinforced leather handle, 37" extending trolley handle, matching luggage tag included. Finish/Material: Cotton Canvas, Leather Dimensions: 18" W x 14" H x 8 1/2" D Imprint Area: 2 3/4" W x 5/8" H Shipping Information: Carton Size: Box Length: 6.00 Box Width: 6.00 Box Height: 8.00 Standard Packaging: Gift Bag Carton Weight: 28lbs / 2pcs. 22" Expandable Wheeled U.S. Carry-On. One-touch, dual-trolley aluminum handle system recesses into bag when not in use. Spacious main compartment expands 2" for additional packing capacity. Interior mesh compression straps feature a zippered pocket for additional organization. Large, interior door pocket features a zippered u-shaped opening and internal mesh zippered pocket. External strap system compresses around the bag to keep contents secure. Removable Attach-a-Bag strap secures an additional bag to the front of the upright for consolidated travel. Durable 1500D polyester combined with 600D VAC (Vinyl Acetate Co polymer) coated polyester for added strength. Size: 15"w x 22"h x 7.5"d [expands to 9.5"d] Decoration Size: 2"w x 4"h Opposite of Swiss Army Shield. Collapsible Dual Compartment Duffel. Pack everything you need for an extended stay with this oversize duffel. Rev 360 rotating handle system puts hand in a natural "palm-facing-the-body" position, reducing arm and wrist strain. Large, ushaped opening with lockable sliders provides access to main compartment and features interior compression straps to secure items. 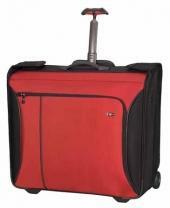 Lockable, zippered bottom compartment allows easy access to items. Zippered end pocket large enough to store shoes features easy-to-clean, antibacterial inner lining. Gusseted, zippered front pocket for additional storage. Custom inline skate wheels with six reinforced spokes for increased strength and ability provide smooth rolling action. Rear guard rails protect bottom of duffel. Top haul handle, dual cargo handles and bottom grip slot make lifting easy. Size: 14"w x 30"h x 18.5"d. Decoration Size: 5"w x 5"h centered on front pocket. Expandable Carry-On. Pack everything you need in this carry-on size upright. Large main compartment with lockable sliders features a removable mesh accessories pouch and interior compression straps to secure folded items. Removable, bi-fold suiter with zippered mesh pocket and foam bolsters keeps clothes wrinkle free. Zippered top pocket features built-in attach-a-bag strap for consolidated travel. Zippered u-shaped front pocket provides quick access to travel documents. Expands 2.5" (6.35 cm) for extra capacity on demand. Rev 360 degree rotating handle system puts hand in a natural position, reducing wrist strain. Custom inline skate wheels with 6 reinforced spokes for increased strength and durability provide smooth rolling action. Includes a clear, airport approved 3-1-1 bag for carry-on liquids. Slide-out ID tray stores neatly in bezel. Top and side haul handles and bottom grip slot make lifting off of the baggage carousel or out of the car easy. Size: 14"w x 20"h x 8"d (expands to 12"d) Decoration size: 5"w x 5"h centered on front pocket. Werks Traveler 3.0 Collection: Patented 360°ree swivel handle with Geluxe Comfort Grip and ergonomic thumb print that rotates and locks into a natural "palm-facing-the-body" position. Curved monopole and 80mm inline skate wheels. Large main storage area features a hanging mesh, zippered pocket. Never Lost Attach-a-Bag strap and removable Simple Strap Bag System to secure an additional bag to the upright. Size: 14"w x 20"h x 9.5"d. Decoration size: 4.5"w x 4.5"h centered on front near top. 28" Expandable Wheeled Upright. CH-97 Collection: One-touch, dual-trolley aluminum handle system recesses into bag when not in use. Spacious main compartment expands 2" for additional packing capacity. Interior mesh compression straps feature a zippered pocket for additional organization. Large, interior door pocket features a zippered u-shaped opening and internal mesh zippered pocket. External strap system compresses around the bag to keep contents secure. Removable Attach-a-Bag strap secures an additional bag to the front of the upright for consolidated travel. Durable 1500D polyester combined with 600D VAC (Vinyl Acetate Co polymer) coated polyester for added strength. Size: 19.5w x 27.25"h x 9.5"d [expands to 11.5"d] Decoration Size: 3"w x 4"h Opposite of Swiss Army Shield. Werks Traveler 3.0 Collection: Patented 360 degree swivel handle with Geluxe Comfort Grip and ergonomic thumb print that rotates and locks into a natural "palm-facing-the-body" position. Curved monopole and 80mm inline skate wheels. Large main storage area features a hanging mesh, zippered pocket and expands 2.5" for additional packing capacity. Removable garment suitor with zippered pocket features foam bolster to minimize wrinkles on hanging garments and a quick-release clip that secures up to 4 hangers. Never Lost Attach-a-Bag strap and removable Simple Strap Bag System to secure an additional bag to the upright. Size: 14"w x 22"h x 10.5"d [expands to 13"d]. Decoration size: 4.5"w x 4.5"h centered on front near top. Traveler 3.0 Collection: Patented 360 degree swivel handle with Geluxe Comfort Grip and ergonomic thumb print that rotates and locks into a natural "palm-facing-the-body" position. Curved monopole and 80mm inline skate wheels. Large main storage area features a hanging mesh, zippered pocket and expands 2.5" for additional packing capacity. Removable garment suitor with zippered pocket features foam bolster to minimize wrinkles on hanging garments and a quick-release clip that secures up to 4 hangers. Never Lost Attach-a-Bag strap and removable Simple Strap Bag System to secure an additional bag to the upright. Size: 18.5"w x 24"h x 11.5"d [expands to 14"d]. Decoration size: 5.5"w x 5.5"h centered on front near top. Werks Traveler 3.0 Collection: Patented 360 degree swivel handle with Geluxe Comfort Grip and ergonomic thumb print that rotates and locks into a natural "palm-facing-the-body" position. Curved monopole and 80mm inline skate wheels. Large main storage area features a hanging mesh, zippered pocket and expands 2.5" for additional packing capacity. Removable garment suitor with zippered pocket features foam bolster to minimize wrinkles on hanging garments and a quick-release clip that secures up to 4 hangers. Never Lost Attach-a-Bag strap and removable Simple Strap Bag System to secure an additional bag to the upright. Size: 21"w x 27"h x 12.5"d [expands to 15"d]. Decoration size: 5.5"w x 5.5"h centered on front near top. Mobilizer NXT 4.0 Collection: 43" aircraft-grade aluminum handle with Geluxe Comfort Grip locks in multiple positions to accommodate travelers of various heights. 80mm inline skate wheels for smooth rolling and superior handling. Front, gusseted pocket is large enough to fit a laptop in our CS2 Vertical Computer Protection Sleeve (sold separately). Interlok Attach-a-Bag System easily stores and secures an additional bag on the front of your upright. Swiss Army tweezers and pen in the bezel of the handle system. Travel Sentry Approved Luggage Lock secures belongings while in transit and allows TSA screeners to open the lock without destroying it, and relock it after inspection. Note: outside ticket pocket could get sewn shut. Size: 13"W X 20"H X 8.5"D. Decoration size: 4"w x 4"h centered on front pocket. 20" Wheeled Carry-On. Werks Traveler Hardside Collection: Aircraft-grade aluminum, patented, curved monopole handle system redistributes the weight of the bag making it feel lighter in hand and provides greater foot clearance while rolling. Patented 360 degree rotating handle, with ultra-soft Geluxe Comfort Grip and ergonomic thumb print, rotates and locks into a natural palm-facing-the-body position to reduce arm and wrist stress. Spacious main storage area features a hanging mesh, zippered pocket. Y-shaped compression straps in the main packing area and inside the bags lid securely hold items in place. Removable garment suiter with zippered pocket features a foam bolster to minimize wrinkles. Integrated Travel Sentry Approved lock allows U.S. TSA screeners to open the lock without destroying it, and relock it after inspection. Made from robust engineering-grade Lexan polycarbonate. Size: 14"w x 22"h x 9"d.
WT-22 and WT Tote. Werks Traveler 3.0 Collection: This all-new collection is designed to be 30% lighter and offer 30% more packing capacity than other wheeled bags in their class while retaining its rugged functionality and modern style. The WT-22 features a patented, 360 degree swivel handle with Geluxe Comfort Grip and ergonomic thumb print that rotates and locks into a natural "palm-facing-the-body" position, curved aluminum monopole handle, removable garment suitor, Never Lost Attach-a-Bag strap and removable Simple Strap Bag System to secure an additional bag to the upright. The WT Tote features removable padded shoulder strap, dual haul handles with unifying wrap, dual end pockets and a rear zippered pocket that converts to a sleeve for sliding over upright handle systems. 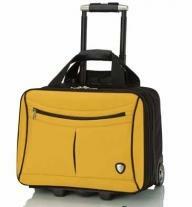 Vibrant yellow and black nylon and neoprene, main body with document compartment, accordion pocket, and garment bag, soft leather handles, convenient ID window on rear, hideaway trolley handle extends to 28", matching luggage tag with Lamborghini emblem included. Finish/Material: 1680D Nylon Dimensions: 18 1/2" W x 13 1/2" H x 10 1/2" D Imprint Area: 1 1/4" W x 1/2" H Shipping Information: Carton Size: Box Length: 18.00 Box Width: 14.00 Box Height: 10.00 Standard Packaging: Gift Bag Carton Weight: 22lbs / 2pcs. Material: Full grain napa calfskin leather, Features organizer section for PDA, cell phone, pens, business cards, etc., and front zipper pocket for small miscellaneous items. Spacious front compartment duals as easy overnight or electronic device storage, Middle compartment provides room for all your document needs, ABS Honeycomb frame protects contents of the case and main compartment is padded with 10 mm high density foam and cushions laptops up to 17 inches, projector, other digital devices or clothing, SmartZipper converts rear pocket to a panel that secures case to a separate wheeled case handle, Padded leather grip handles and, no-slip, contoured shoulder strap make it a comfortable carry while impact absorbent, recessed in-line skate wheels (constructed of high-grade polyurethane sealed ball bearings anchored to steel axles) make it roll with ease, Locking point-click aluminum telescope handle retracts into shell, Bonus! Removable double compartment leatherette briefcase nests in middle compartment and allows you to grab files and go. 30" Collapsible Wheeled Duffel. Mobilizer NXT 4.0 Collection: 43" aircraft-grade aluminum handle with Geluxe Comfort Grip. 80mm inline skate wheels for smooth rolling and superior handling. Removable internal rods provide structure and stability and allow the bag to collapse for storage. Spacious main packing compartment features a zippered, fine mesh pocket and a hanging pocket for organization. Gusseted front pocket with key fob, and elastic and zippered mesh pockets help organize personal and quick-access items. Dual haul handles with unifying leather wrap. Swiss Army tweezers and pen in the bezel of the handle system. Proprietary Isotech fabric features robust 2100D ballistic nylon for maximum durability. DISCONTINUED Size: 15"W X 30"H X 14"D. Decoration size: 6"w x 2.5"h centered on front pocket. 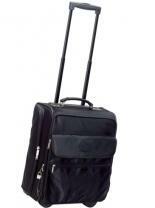 24" Wheeled Travel Case. Werks Traveler Hardside Collection: Patented 360 degree rotating handle, with ultra-soft Geluxe Comfort Grip and ergonomic thumb print, rotates and locks into a natural "palm-facing-the-body" position to reduce arm and wrist stress. Durable urethane wheel units feature bearing-constructed swivel casters that allow the bag to rotate 360 and to be transported in either a leaning or upright position producing zero weight-in-hand when rolling upright. Main storage area features a hanging mesh, zippered pocket and y-shaped compression straps to securely hold items in place. Removable mesh divider wall promotes air flow and keeps clothing organized. Front divider wall in the bag?s lid compresses clothing and offers dual compartment packing. Removable garment suiter with zippered pocket features a foam bolster to minimize wrinkles. Integrated Travel Sentry Approved lock allows U.S. TSA screeners to open the lock without destroying it, and relock it after inspection. Made from robust engineering-grade Lexan polycarbonate. 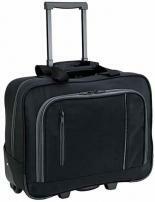 Size: 17"w x 26"h x 10.75"d.
27" Wheeled Travel Case. Werks Traveler Hardside Collection: Patented 360 rotating handle, with ultra-soft Geluxe Comfort Grip and ergonomic thumb print, rotates and locks into a natural "palm-facing-the-body" position to reduce arm and wrist stress. Durable urethane wheel units feature bearing-constructed swivel casters that allow the bag to rotate 360 and to be transported in either a leaning or upright position producing zero weight-in-hand when rolling upright. Main storage area features a hanging mesh, zippered pocket and y-shaped compression straps to securely hold items in place. Removable mesh divider wall promotes air flow and keeps clothing organized. Front divider wall in the bag's lid compresses clothing and offers dual compartment packing. Removable garment suiter with zippered pocket features a foam bolster to minimize wrinkles. Integrated Travel Sentry Approved lock allows U.S. TSA screeners to open the lock without destroying it, and re-lock it after inspection. Made from robust engineering-grade Lexan polycarbonate. Size: 50w x 75h x 30d cm. Sturdy nylon and Spanish leather, exterior front pocket secured with unique combination lock, convenient ID window on rear, side and top handles, extendable T-bar trolley handle, padded main compartment, matching luggage tag with Lamborghini emblem included. Finish/Material: 1680D Nylon, Leather Dimensions: 14 1/2" W x 20" H x 10" D Imprint Area: 1 1/4" W x 1/2" H Shipping Information: Carton Size: Box Length: 14.00 Box Width: 20.00 Box Height: 10.00 Standard Packaging: Gift Bag Carton Weight: 27lbs / 2pcs. Luxurious Takuda leather, two exterior front pockets for cell phone, accessories, and documents, interior compartments and laptop pouch, convenient ID window on rear, ergonomic trolley handle extends to 39", matching luggage with Lamborghini emblem included. Finish/Material: Leather Dimensions: 14 1/4" W x 18 1/2" H x 8 1/4" D Imprint Area: 1 1/4" W x 1/2" H Shipping Information: Carton Size: Box Length: 14.25 Box Width: 18.50 Box Height: 8.25 Standard Packaging: Gift Bag Carton Weight: 25lbs / 2pcs.